ST. LOUIS — Boone Jenner and Anthony Duclair each scored twice, and the Columbus Blue Jackets rallied from a two-goal deficit to beat the St. Louis Blues 7-4 on Thursday night. 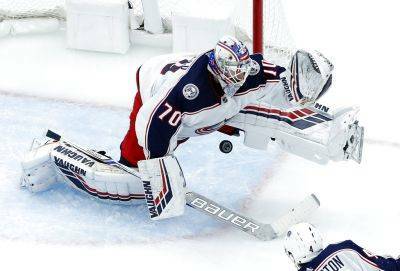 Josh Anderson had a goal and an assist, David Savard and Seth Jones also scored, and Joonas Korpisalo made 33 saves as Columbus snapped a two-game losing streak. Vladimir Tarasenko, Jaden Schwartz, Alexander Steen and Zach Sanford scored for the Blues, who blew their second straight two-goal lead. Jake Allen gave up four goals on 21 shots before being lifted for Chad Johnson in the second period. St. Louis gave up a season high in goals. Savard’s goal from above the right circle made it 4-2 at 8:58 and chased Allen. Steen’s goal with 8:30 left got the Blues within a goal, but Anderson and Duclair countered early in the third put the game away. Tarasenko gave the Blues a 1-0 lead with a power play goal at 4:26 of the first period. Tarasenko scored from behind the goal when his centering attempt went off of Korpisalo’s paddle. Schwartz gave the Blues a 2-0 lead with 7:20 left in the first, before Jenner’s power-play goal got Columbus on the board with 3:13 left.